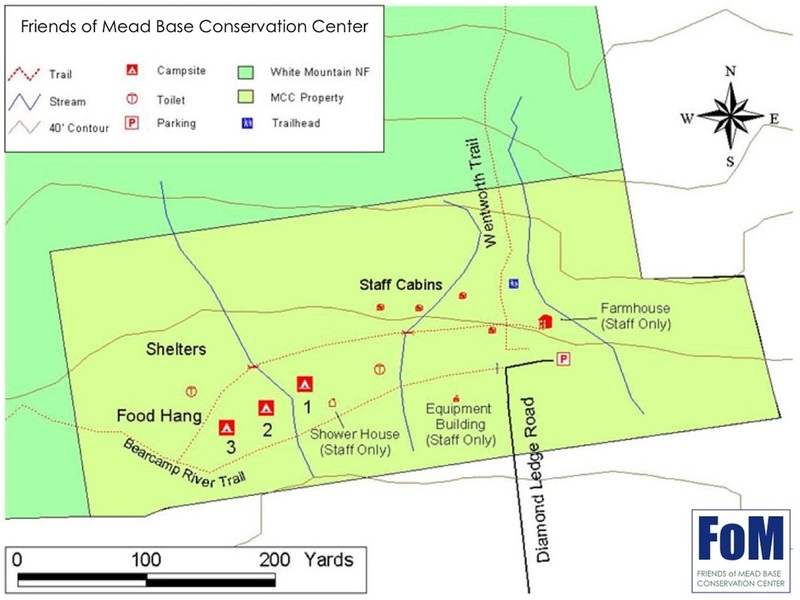 There are three camping sites at Mead. Site #1 can accommodate up to 30 people. Sites #2 and 3 are limited to 8 campers each. Fees are $25/night for groups of up to 8 people, and $45/night for groups from 9 to 30 people. The same fees apply for day use of a campsite with a fire. Wood bundles are available for $5. Please do not bring non-native wood to Mead Base! Seasonal water (turned off during the winter) and a year-round toilet are available. There are no showers. The house is also available for day use only by special arrangement at $75/day. Maximum capacity is 50 people. There is no fee for day use of the parking lot or the grounds, but any donation is especially welcome. To reserve a campsite, please contact Fred Lavigne at (603) 284-6919 or Sam Smith at (603) 284-6571, or email: samuels@unh.edu.